The flip I first planned to feature did not go as expected. Sometimes you've got to move with the tide, tap into your resourcefulness and find another path. Enough with the idioms though. 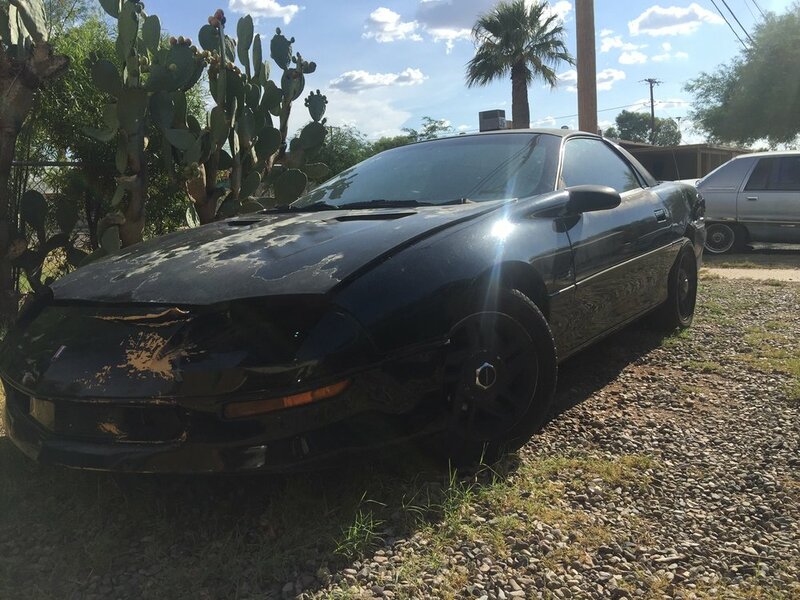 I purchased a Black 1993 Z28 for $700.00 several months ago. It didn't run when I paid for the car, but I swapped a part out in the seller's driveway and drove it home. So far so good. It became apparent to me that I should have probably fixed it before paying him and test driven it so I could have haggled even lower - the transmission was shot. The main issue was extremely hard shifting, a bang during shifting because the transmission mount had vaporized like a vampire in sunlight. I thought it was going to be a quick flip. I was wrong for several reasons. In all of its busted glory. You see a POS, I see hundred dolla bills. The car had 207,000 miles on it. Even though the engine ran great after a little tweaking and tuning, buyers can't see past the miles - and I don't blame them for it. I have a policy about describing things as accurately as possible on Craigslist - I believe this reduces tire kickers, but it has an unfortunate side effect. When describing a crummy old car, it tends to attract people that want to do flips. Those aren't the customers you want if you are the flipper. You want someone to come along and just want to drive the car. No work or effort on their part. Flippers are low ballers. When you're trying to sell a cheap car, those are your main clientele. Before I get into the sale and how that ended up going down, I'll give a brief list of costs associated with the car start to end. There you have it. A total of $1250.00 invested, and a good chunk of man hours. After having the car listed originally at $2300, I whittled the price down after getting no bites, week, after week, after week, until it sat at the lowest I decided I would take for it, which was $1600.00. That puts me at a meager 350 dollars profit for what required a grand total of 16 hours of work. To add icing to the cake, the car wouldn't even sell for that! The best offer I got was a dude who wanted the car for the whole drivetrain - and wanted to drive it home for $1200.00, to which I said no way, "the car is worth more in parts alone." I said. This is the transmission after the rebuild. Squeaky clean and fully functioning! So for doing the sales of the parts, I make an extra 375 bucks on the whole deal over what I was trying to sell the whole car for. Not the ideal situation, but sometimes you have to adapt to a changing environment. My total profit would be 725 at this point, and I employed my friend to the tune of 500 bucks on top of it. He gets money, I get money, we all go home richer. I still consider it a win, although I won't be doing any more 4th gen LT1 F body cars. Lesson learned. It looks neat even with the body damage (cooler IMO) but don't be fooled. A rule of thumb on a flip is that if it requires more than just a tiny fraction of work, you should always double your money on the deal, at least. I disobeyed that rule on this one and it bit me. Learn from my mistakes!